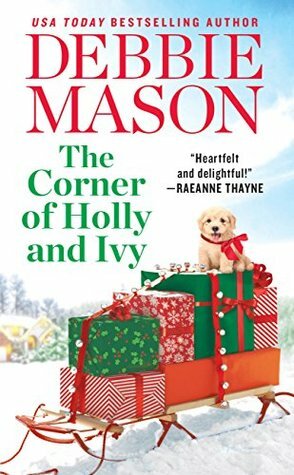 The Corner of Holly and Ivy by Debbie Mason is the seventh book in the contemporary romance Harmony Harbor series. The series not only takes place in Harmony Harbor but features a different single Gallagher male falling in love. With each book in the series having a different main couple they could be read as a standalone if choosing to do so. The Corner of Holly and Ivy is Connor Gallagher and Arianna Bell’s second chance love story. Conner and Arianna had been high school sweethearts but had split apart although their feelings have never gone away. Conner realizes the depth of his feelings when Arianna is injured in a fire in her shop and knows he doesn’t want to live without her. However, as Arianna recovers from her burns she finds herself helping her grandmother in the campaign for town mayor and when her grandmother needs to pull out of the race Arianna takes her place. And just as Arianna is thrust into the race Connor ends up having to replace his uncle pitting the two against one another giving them another obstacle at their second chance at love. I joined the Harmony Harbor series later on so I’m never quite sure if previous characters appear or not but even with the late start I’ve found myself enjoying each new book. The one thing about Debbie Mason is she takes her romances to a whole new level with plenty of content to make for a more action packed romance than just two people falling in love. In this one both characters are dealing with family, a political campaign and then the outcome of the campaign and their own ups and downs together. So again this was another fun trip to Harmony Harbor that I’m sure romance readers will enjoy. Debbie Mason is the bestselling author of the Christmas, Colorado and the Harmony Harbor series. Her books have been praised by RT Book Reviews for their ”likable characters, clever dialogue and juicy plots.” She also writes historical paranormals as Debbie Mazzuca. Her MacLeod series has received several nominations for best paranormal as well as a Holt Medallion Award of Merit. When she isn’t writing or reading, Debbie enjoys spending time with her very own real-life hero, their four wonderful children, an adorable grandbaby, and a yappy Yorkie named Bella. I was looking at this one!! This sounds good! Terrific review, Carrie! This is another author I’ve wanted to try, and I’m happy to hear you enjoy her books. This one sounds good Carrie. I have only read a couple from this series, so I shall see if this one works for me. Nice review.